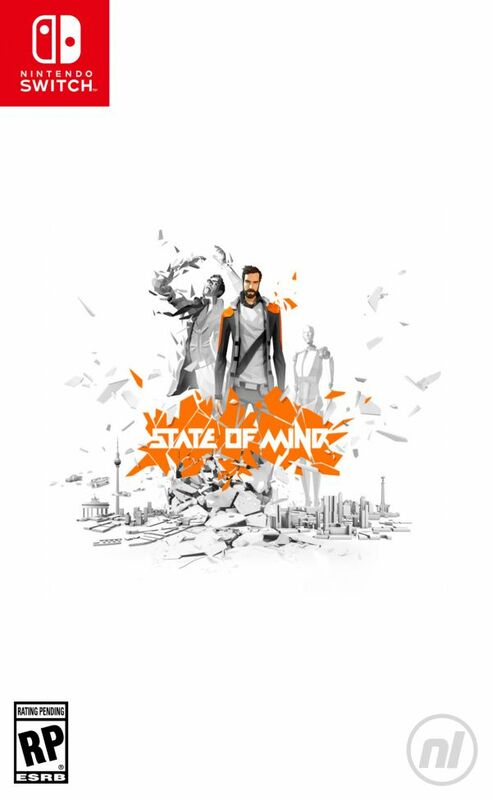 From beginning to end, State of Mind is a game of polarising contrasts. It has an intriguing sci-fi setting, but a story that tries to make one too many social commentaries and ends up muddled as a result. It uses low-poly character models, but boasts some of the most impressive environmental textures and lighting we’ve ever seen on Switch. It’s a game of significant potential and half-baked execution. It’s a game with both genuine characters arcs and storytelling cliche. It’s even got the voice of Geralt of Rivia, but a clunky and rote script to boot. At its core, Daedalic Entertainment’s new project is a narrative-driven story set in a world where advances in technology have simply added to society’s schisms, rather than help solve them. Natural resources are running out, drone wars rage in the Middle East and faceless, armed ‘bots’ police the streets. Set mainly in Berlin in 2048 (although the story does jump around its own timeline quite a bit), you step into the surly shoes of one Richard Nolan, a notorious journalist recovering from a recent automobile accident. Grumpy, prickly and lacking any tangible people skills, Nolan has made a name for himself publically investigating government practices and, as you might expect, making plenty of enemies along the way. However, his life takes an even darker turn when he realises his wife and son have vanished in the wake of his accident, and what starts as a domestic drama spirals into a worldwide conspiracy that will affect millions of lives by the time the credits roll. It’s certainly not the most original of concepts - taking heavy inspiration from so many seminal sci-fi sources, ranging from Blade Runner to The Matrix - but by the same token, there’s plenty to like here as well. With the exception of its character models (which purposefully use a sharp, polygonal look that ultimately gives them a dated, late-'90s PC feel), the locations you’ll inhabit are almost always a joy to explore in detail. You can see scratch marks on the sides in Nolan’s kitchen. You’ll watch as rain droplets hammer the tarmac of a neon-lit road. You’ll marvel as warm daylight dances off the glass of a beautiful art exhibit. 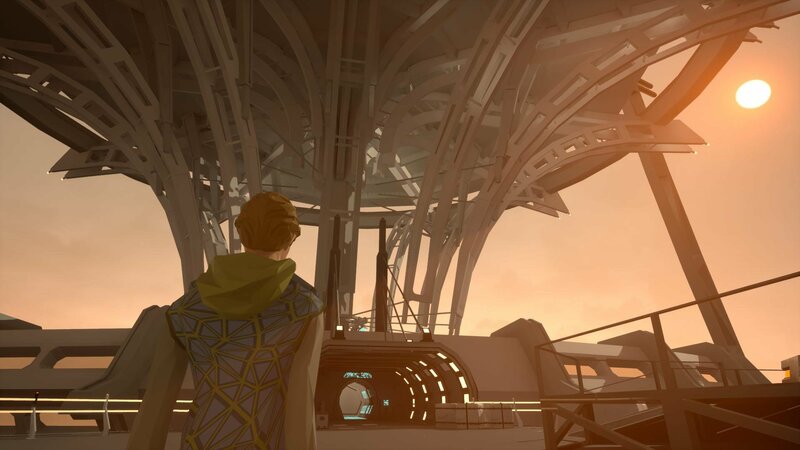 The German developer has managed to maintain these striking visual traits on Nintendo Switch, with only a handful of framerate drops throughout its 10-to-12-hour-long story, but the same can’t be said for State of Mind’s needlessly convoluted story. Even the dulcet tones of Doug Cockle (aka Geralt of Rivia from The Witcher saga) struggles to bring gravitas to a clunky script and a plot that’s juggling one too many threads. There are commentaries on transhumanism, social division, the impact of surveillance and the concept of emerging identity, but none of them bring anything new to the table and ultimately end up overshadowing the more mundane - yet far more emotionally resonant - parts of Nolan's life. 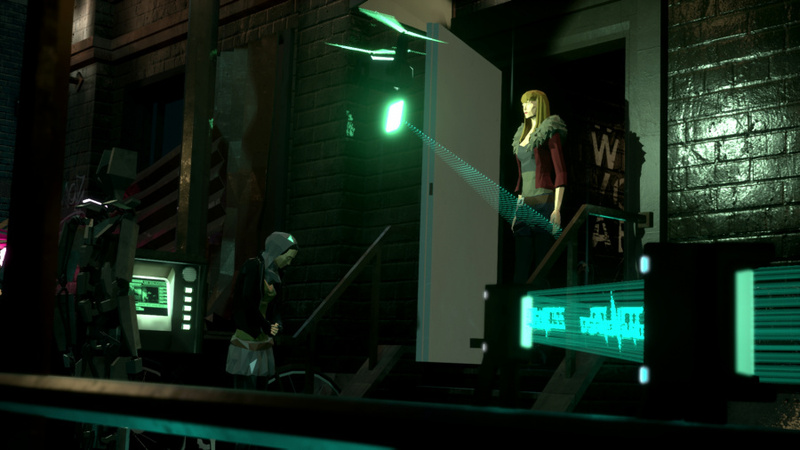 Those moments - much like the games of David Cage - are where State of Mind shines most. Whether it's making breakfast for a family member, watching a squid-like robot companion soothing a loved one or simply sitting down to play a tune on the piano, you'll find yourself longing for these moments when you're slogging through another long-winded conversation about dystopian conspiracies. For the most part, you’ll walk around different locations interacting with different objects and people, with the occasional mini-game thrown in to break up the slow march of its plot. Some of these mini-games are great fun - piloting a drone through a medical facility, stealthily avoiding patrols and using air vents like a maze is one example - but they don't come along often enough. However, once you realise the story isn’t going to pick up its pace any time soon, you’ll often run into a room and just look for the green inverted triangles that denote an as-yet-uninteracted-with point of interest, and then run off to the next one. 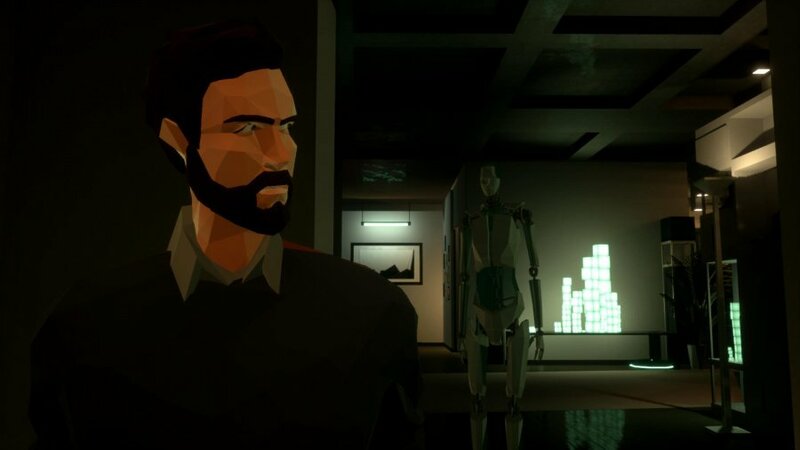 There’s a real point-and-click feel to State of Mind, but you never get the impression your decisions have any tangible impact on the story you’re experiencing. There are narrative choices to be made in dialogue, but most of the time the plot follows a linear route that rarely deviates from a set path. 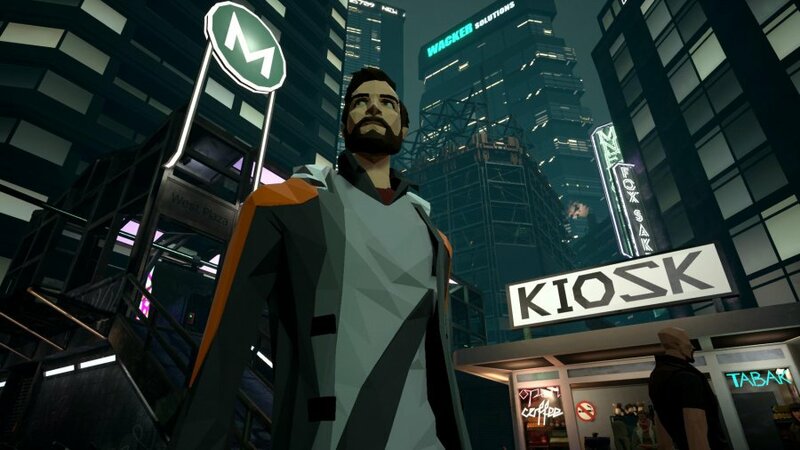 With its dystopian setting, transhumanistic theme and noticeable love of triangles, it’s clearly a game that’s taken much inspiration from the modern Deus Ex series. 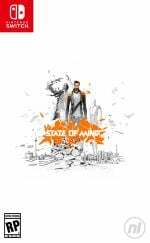 However, unlike Square Enix’s seminal franchise, State of Mind rarely offers any sense of palpable danger. There’s no real combat to speak of, and any stealth sections tend to opt for quick cuts that stop you from straying into a security camera’s field of vision. These moments instead fall back on simple puzzle elements - such as using terminals to create a path through a security-filled train station - so you never truly feel on edge, despite the fact you’re following a story filled with nefarious corporations, terrorist bombings and gun-toting robots. State of Mind is obviously meant to be a slower and more measured affair, but it's often too slow for its own good. I kinda expected this to be so so, the graphics and art style are fantastic but the gameplay videos didn't seem like alot was going on action wise. Too bad. I really dig the idea and the setting. @Romeo-75 it's a ****ing adventure game from the makers of stuff like Harvey and Edna. The hell did people expect? Some kind of action romp? There is no NA release what a load of BS. Mh, I still want this - story driven SF stealth? Sign me up, even if its 6/10. Wow at the first post. Regarding the review, it's a shame, but about what I expected from Daedalic: gorgeous and tender, but ultimately unsatisfying and shallow. Does the game have German VO? That helped get me though Silence. Might pick this up on sale, because it really is a looker. The average P&C gets 6/10, so this means it's playable lol. I wanted it to review better but eh, I'd be willing to still give it a shot since I'm partial to P&C's myself, but I can't justify this price. I'll leave it backlogged and await a hard sale. I doubt it will, but if it gets a physical release, I'll try to GameFly it. @Tsurii. Yes that would be awesome . I will still get it. 6/10 means there is a decent game there and depending on the person there is fun to be had. I've had my eye on this one for sometime. I was expecting 6 or 7 for the game, the art style is what really appeals to me.. price is a little on the steep side but it's not going to put me off. Again, another game on the Switch that gives you the nice feeling of being ripped off because it's, again, cheaper practically everywhere else. This feeling prevents me from buying so many games on the Switch because I always feel like I'm getting a very bad deal buying it on that platform. Sometimes even when on sale, it's still pricier than on competing platforms. The game looks fabulous, I love the art style, but given it seems pretty average otherwise, this has been moved to my "when under $10" bin. Currently a physical release only in Germany. Hopefully, this will at least get a port to the UK so I can import a copy. I watched a couple of trailers & a gameplay video, & and I like what I saw. I'm planning on downloading this game at some point in the near future. Hopefully people in their early teens will still be able to enjoy it. They typically haven't yet been exposed to all of the tired tropes a story in question might push. I think we all have something we hold dear from that age, that we later found out to be a sordid mish-mash of what had gone before, but we appreciate the wrapper we received it in nontheless. I'm still kinda interested, might check it out when it's on sale. In Rest of europe 15 August 2018. State of mind in spain until 31 august 2018.
they could do nothing about it to change it. Will probably try it one day, pretty large file size though. I got it today! Just stumbled upon the retail version in my small town electronics store. Looks good so far! @MeloMan This has physical release in Germany and Spain now. On eBay.